Library United States Mint Proof Sets Versus Uncirculated Sets – What Are They & How Do They Differ? United States Mint Proof Sets Versus Uncirculated Sets – What Are They & How Do They Differ? United States Mint proof sets and uncirculated sets are two of the most popular products for coin collectors. These coin sets, produced on an annual basis and sold by the United States Mint primarily to coin hobbyists, include mint-condition specimens of circulating coinage. While this is one similarity between both uncirculated sets and proof sets, there are many differences between these coin sets, too. Proof sets – These consist of coins that are struck with specially prepared dies on polished planchets (coin blanks). Proof coins are struck multiple times to bring up minute details, producing sharp-looking coins with frosted, cameo devices and deep, mirror-like fields. Uncirculated sets – Often referred to as mint sets, uncirculated sets usually contain one example of each circulating coin for a given year. Most often, these include one coin from each denomination representing all mints striking those coins during that year. Proof sets and uncirculated sets come in various sizes; for example, pre-1959 mint sets included two examples of each circulating coin, meaning as many as 30 coins are packaged in some of the uncirculated sets packaged from 1947 through the mid 1950s, when the Philadelphia, Denver, and San Francisco Mints were all regularly striking circulating coins. Meanwhile, proof sets have grown from as few as five coins during most years before 1999 to 18 coins in 2009. Many coin hobbyists collect proof sets and mint sets, as well as those who don’t formally identify as coin collectors. One reason many non-numismatists collect proof sets in particular is because these beautiful coin sets are wonderful for marking the years of special occasions such as birthdays, anniversaries, graduations, and other milestone events. Indeed, proof sets make wonderful gifts and are often given to individuals who have no prior inclination to numismatics, let alone looking at coins with much, if any, interest. Meanwhile, coin collectors enjoy buying proof sets because the coins contained within are of presentation quality, representing the very best quality the United States Mint can produce. In a similar fashion to proof sets, uncirculated sets provide collectors with high-quality, mint condition coins. Oftentimes, uncirculated sets provide collectors with coins of generally better condition than those from the same years that are found in bank rolls. While non-collectors tend to favor proof sets, mint sets also make fantastic gifts for those who enjoy mementos of certain landmarks years in their lives. Uncirculated sets are also popular collectibles for diehard numismatists who want pristine examples of business-strike coinage. In many cases, coin hobbyists will seek uncirculated sets as well as proof sets when they want to complete series collections, such as an entire date run of Lincoln cents, Washington quarters, or Eisenhower dollars. Of course, those who buy uncirculated sets or proof sets with the purpose of filling holes in coin albums intend to break these products up. For that reason, there are far fewer complete proof sets and uncirculated sets from any given year today than there were when those coin products were first sold by the U.S. Mint. While proof coins were minted in small numbers on a fairly consistent basis throughout the latter 19th and early 20th centuries, the United States Mint did not begin producing proof sets as we know them today until 1936. These first official proof sets consisted of five coins (Lincoln cent, Buffalo nickel, Mercury dime, Washington quarter, and Walking Liberty half dollar), each of which was packaged in its own cellophane envelope; these cellophane packets were bundled together with a staple and packed with tissue in cardboard boxes. Some 1942 proof sets include both the regular Jefferson nickel and the 35 percent silver Jefferson Wartime five-cent coin. The U.S. Mint took a seven-year hiatus on proof sets from 1943 through 1949 to focus on ramping up business-strike coin production for the bustling World War II economy and also to handle the striking of medals for those who served in the military during the war. Once proof sets returned to the Mint lineup in 1950, the coin sets looked largely the same as they did in the early 1940s, save for the change in design with the inclusion of the relatively new Roosevelt dime and Franklin half dollar. 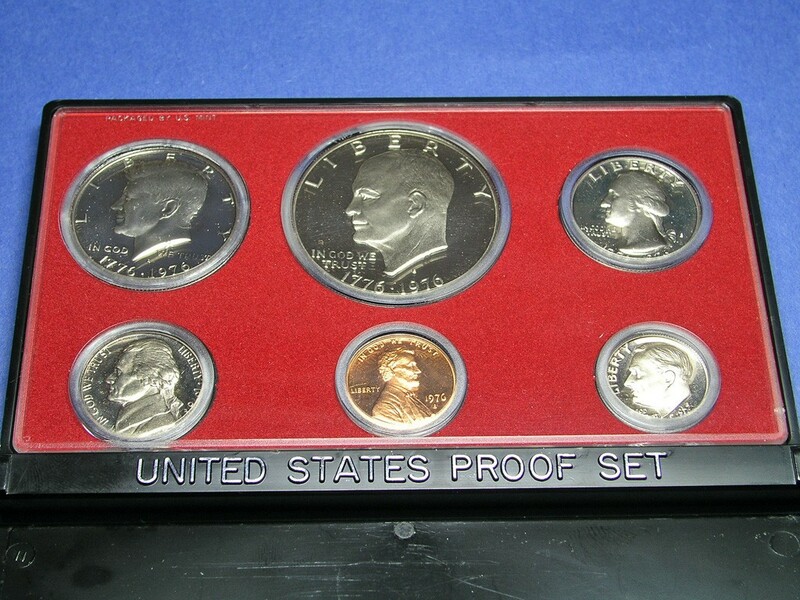 In mid 1955, the United States Mint began issuing proof sets in one cellophane packet that includes all five coins in a single package; these sets also include a foil-lined insert that bears the words “U.S. Mint Philadelphia.” These single-package cellophane proof sets are called “flat packs” in numismatic nomenclature and are differentiated from the “box sets” made from 1936 through mid 1955. The flat packs were sold in yellow manila envelopes that contain the address of the Treasury Department in Philadelphia. All sets issued from late 1955 through 1964 are generally identical in appearance, though the Lincoln wheat cent was replaced in 1959 with the Lincoln Memorial motif, and Franklin half dollars were supplanted in 1964 with the Kennedy half dollar. No proof sets were assembled from 1965 through 1967; that is when the U.S. Mint issued Special Mint Sets, which are essentially high-quality business-strike coins. Proof sets returned in 1968, though the format of these coin sets is a little different from the pre-1965 proof sets; for the first time ever, proof coins were manufactured at the San Francisco Mint and bore “S” mintmarks. Additionally, the coins are contained in hard plastic cases instead of the cellophane flat packs made during the 1955 through 1964 period. Another significant change in 1968 was the composition of the dime, quarter, and half dollar, which had changed since the coins last appeared in proof format in 1964. The 1968 proof dimes and quarters were the first of their kind made from copper-nickel clad, while the proof half dollar is a 40 percent silver coin, versus the 90 percent silver composition used for halves made before 1965. The first copper-nickel clad proof half dollar was issued in 1971. In 1973, copper-nickel clad Eisenhower dollars were included in regular-issue proof sets, making these the first 6-coin proof sets manufactured during the modern era (which began in 1936). Dollars were included in proof sets through 1981, when the last of the Susan B. Anthony dollars were made during their original run. Regular proof sets returned to a 5-coin format through 1998. In 1999, U.S. proof sets were substantially expanded in size to include the newly released 50 States Quarters. The proof sets made during the 21st century generally include more than a dozen coins, including the various quarter releases and dollar coins. In 1975 and 1976, 3-coin proof sets containing 40 percent silver versions of the Bicentennial quarter, half dollar, and dollar were offered for sale by the U.S. Mint. Another proof set variant is the Prestige Proof Set, which includes the regularly circulating coinage plus one or two commemorative coins from a given year. These were issued on a nearly annual basis from 1983 through 1997. In 1992, the United States once again began issuing 90 percent silver proof versions of the Roosevelt dime, Washington quarter, and Kennedy half dollar. In recent years, the United States Mint has begun selling a plethora of other proof set products featuring various regular-issue and commemorative coin combinations. Uncirculated sets were first issued in 1947 in cardboard panels, with each holder containing two examples of each denomination made at a given mint. Uncirculated sets from the late 1940s and early 1950s include up to 30 coins, including pieces from the Philadelphia, Denver, and San Francisco Mints; one note about mint sets from that era is that none were issued in 1950. In 1959, uncirculated sets were first packaged in cellophane packets more familiar to coin collectors from more recent times. The coins in the cellophane-packaged mint sets are divided by their mint of origin, with the five Philadelphia coins (cent through half dollar) contained in a blue-striped package and five Denver coins housed within a red-themed cellophane packet. Additionally, each of these mint set packets contain plastic tokens, one themed for the Philadelphia Mint and another for the Denver Mint coins. The two cellophane packets are contained within a yellow manila envelope that bears the address of the Treasury Department in Philadelphia. In 1965, the U.S. Mint issued Special Mint Sets that contained just five coins; sets from the first year of the Special Mint Set program are packaged in a cellophane packet similar in appearance and format to the 1955-1964 proof sets. 1966 and 1967 Special Mint Sets are contained in hard plastic containers that many numismatists consider forerunners to the hard plastic holders that have been used for U.S. proof sets made since 1968. Mint sets returned to their more typical cellophane format in 1968, though their outer envelopes are whiter in appearance than the yellow manila envelopes used prior to 1966. In all cases where San Francisco Mint coins are included in mint sets that were made between 1968 and 1981, the “S” mint coins appear in the red Denver-themed packets. The last regular-issue 40 percent silver Kennedy half dollars are included in the 1970 mint sets, with the caveat being that the 1970-D Kennedy half dollar (the only business-strike halves made that year) was not officially released into circulation; it should be noted that many 1970-D Kennedy half dollars were later removed from their mint sets packets and have since appeared in circulation, explaining why some people find these relatively scarce halves. Eisenhower dollar coins were first included in 1973 mint sets, and these were later replaced by the Susan B. Anthony dollar in 1979. The last mint sets contained within white outer envelopes that also include Susan B. Anthony dollars were issued in 1981. During 1982 and 1983, mint sets were temporarily discontinued during a federal budget crisis. When mint sets reappeared in 1984, they were packed in colorful envelopes featuring illustrations of U.S. coinage. This general packaging format continued into the 21st century. Beginning in 2007, uncirculated sets were housed in a colorful pliable board that provides two-sided viewing for all of the coins contained within; this is a stylized nod to the cardboard mint set panels of the 1940s and 1950s. The paneled mint sets continue in production as of this writing. There have been a few uncirculated set variations over the years. Notably, the U.S. Mint produced a 3-coin 40 percent silver uncirculated set containing the Bicentennial quarter, half dollar, and dollar in 1975 and 1976. Also in the 1970s, the Philadelphia and Denver Mints began producing so-called souvenir sets. Souvenir sets contain only five coins produced at the given mint and a bronze Mint medal honoring that minting facility; the Philadelphia souvenir sets were available for sale only at the Philly Mint gift shop and the Denver souvenir sets could be bought only at the mint in the Mile High City. These souvenir sets were made through the 1990s. Souvenir sets are sought by many coin collectors, and most particularly so are the 1982 and 1983 souvenir sets, which are the only official U.S. Mint products to contain uncirculated specimens of the business-strike coins from those two years. Other popular uncirculated set variants are the Susan B. Anthony dollar mint sets that were made during 1979, 1980, and 1981. More recently, the U.S. Mint has offered various other formats of uncirculated coin sets, including products that contain only America the Beautiful Quarters and dollar coins from certain years. There is a relatively soft market for proof sets and uncirculated sets, with the general rule being that prices on modern proof and mint set products usually come down in value within a few years after their issue. There have been a few exceptions to this, with the 2008 and 2012 uncirculated sets still selling for two to three times their issue prices years after their releases; meanwhile, several recent silver proof sets have increased in value due to relatively low production figures. Proof sets and mint sets made during the early 1960s have slight numismatic premiums, though overall their market prices are largely dictated by the prevailing silver bullion values. Meanwhile, early proof sets and uncirculated sets (generally those made before the late 1950s) have strongly increased in value since their release and ride price fluctuations that are independent of the silver bullion market. Investing in proof sets and uncirculated sets does not necessarily entail a huge monetary investment. However, due to relatively weak market activity over the past couple decades, mint sets and proof sets may not provide buyers with any significant returns on their investment for several years to come. The general rule for investing in coins applies to uncirculated sets and proof sets: buy for enjoyment, not for profit. Coin collecting is meant to be enjoyed, and is not a guaranteed means for making money. If profits come, that is great for the seller and truly is icing on the numismatic cake. However, if you buy proof sets and mint sets for the sheer joy of collecting them, you’ll be assured of 100 percent satisfaction coming from the hobby dollars that you spend.